At Gallereo we've been following the progress of the Times Square to Art Square Project (TS2AS) in their bid to turn Times Square, New York, into an artwork-billboard extravaganza. For that reason, we were glad to read recently that the Times Square Alliance maintains an ongoing commitment to bring art to the Crossroads of the World. This week the Alliance is hosting a public art exhibition in collaboration with The Armory Show, to fall in line with a range of art fairs that are forming the centre of the New York art world this week. The exhibition began on the 1st March and features artists such as David Kennedy Cutler, Kyu Seok Oh, Niki de Saint Phalle, Tom Otterness and Grimanesa Amoros. By Tom Otterness, who is represented by the Marlborough Gallery, this is a 9-foot tall bronze sculpture that can be found, along with the next three sculptures, at Duffy Square and the Broadway Plaza between 46th and 47th Street. Niki de Saint Phalle, with Nohra Haime Gallery, has a 10-foot tall female figure on show, make of ceramic tiles, glass pebbles and mirrored glass. By Brooklyn artist David Kennedy Cutler with the Derek Eller Gallery. Again, another 10-foot tall sculpture which is comprised of compact discs, plexiglass, archival inkjet print and resin. The work was originally commissioned by the Socrates Sculpture Park. Another Brooklyn artist at work on this scultpure; Kyu Seok Oh, along with the West Harlem Art Fund. 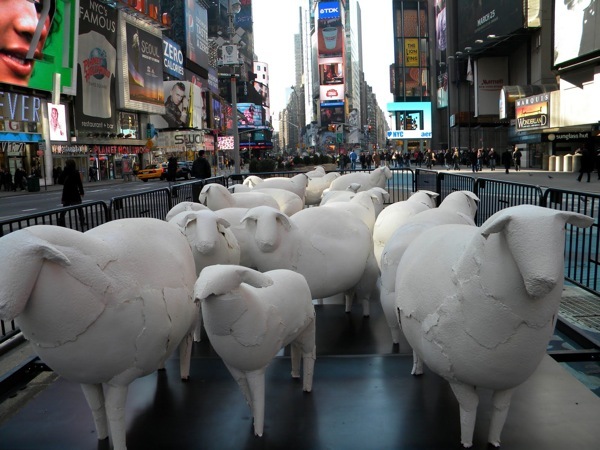 This is a 36-foot long installation of a flock of hand-made paper sheep. This particular work can be found on the Broadway Plaza between 45th and 46th Street.